Thrive Leadership Conference 2015 is hosted by Ray Johnson, pastor of Bayside Church in Granite Bay, CA. Although not listed on the conference website, Mark Driscoll has been announced as a speaker tomorrow. He is slated to speak in a general session at 10am PT. Bayside Church hosted Driscoll’s Real Marriage conference in 2014. Driscoll will be interviewed by Brian Houston at the summer Hillsong Conferences in London and Sydney. These appearances have been targeted by a petition drive designed to put pressure on Hillsong to drop Driscoll from the program. Preachers, think twice before you use other people as illustrations. Now, the depiction of the Trinity is troubling here. Is Jesus God’s little boy? Readers who have experience with Morris/Gateway: Is it common in sermons to poke fun at less fortunate folks? I don’t want to seem picky but the disabled are stigmatized enough already. I doubt parents of kids with intellectual disabilities saw the humor. Readers: Am I overreacting or does Rev. Morris owe his audience an apology? 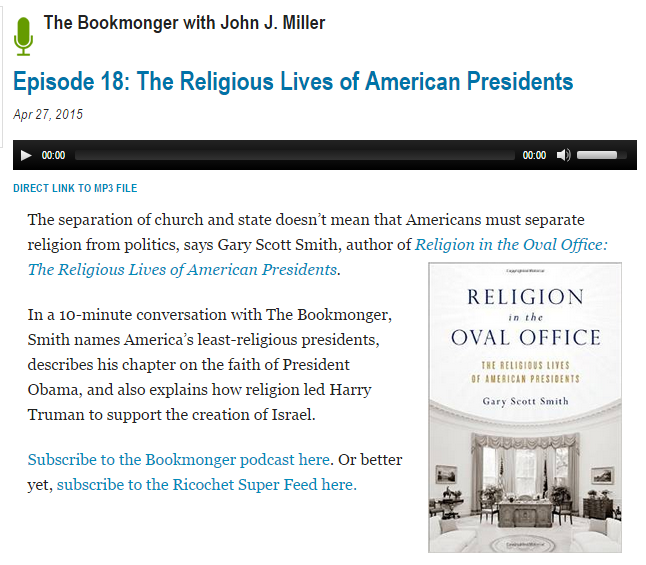 My Grove City College colleague Gary Scott Smith is featured talking about his new book on American presidents and religion in a podcast on conservative website Ricochet. Click the image to listen to the interview. Gary is chair of the history department at GCC and an immense help to me in understanding how historians operate. He has reviewed and offered helpful suggestions for many of my blog posts debunking David Barton. You can read an interview with Gary about the book at John Fea’s blog here. This was a welcome outcome to what had the potential to be a serious snafu for the SBC. Whatever the organizers’ intentions, Baptist21 has this exactly right – hosting any political candidate carries a tacit implication of endorsement. Baptists and other evangelical denominations would do better to stop platforming political candidates at all. This includes handing out political pamphlets and “voter guides” at church. Kidd has this exactly right. Perhaps churches have a right to speak politically but, in my opinion, they shouldn’t be arms of political parties whether on the right or left. Of course, this view of the church’s mission flies in the face of the Christian nationalist position. Fueled by a belief that their brand of Christianity should dominate the culture (dominionism), Christian nationalists view politics as a kind of evangelism where God is proclaimed as a political answer to political problems. Most conflate the Christian church with Old Testament Israel and mistake the promises made to Israel as promises to the church. Today, David Barton’s Wallbuilders Live broadcast their interview with Kent Hovind. There is a vigorous group of folks who have taken positions on Hovind’s crimes and I will be interested to read their comments about the interview. Barton began by saying that people who do what Hovind did spend an average of 18 months in prison, if they spend any time there at all. Barton and Green think the length of his sentence is a red flag. Hovind said he didn’t know any better, and he said the structuring law is stupid. He said he has paid every tax he owes. On this video, he says he hasn’t paid taxes in 28 years. Barton links to freekenthovind.com; I encourage readers to also examine hovindology.com. Is There a Controlling Leadership Culture at Gospel for Asia? K.P. once said at a prayer meeting that it would be sin to say “I’ll pray about it” instead of “Yes sir,” were he to request you move to Burma. The letter also claims that GFA leaders believe they will be held accountable if their directives lead to negative outcomes. They teach that God will not hold a staff member accountable if they sin in following GFA leadership. They teach that only GFA leadership would be accountable in the event that leadership steered them wrong. This is a false teaching, very similar to the the Shepherding Movement of the 1970s. GFA leaders have also told some staff who wanted to leave that they didn’t approve them leaving, as though they would be in sin by rebelling against the God-appointed leaders of their entire lives if they leave. Another problem, say the GFAD, is the authority claimed by K.P. Yohannan while in India. As evidence, the GFAD show this picture of K.P. 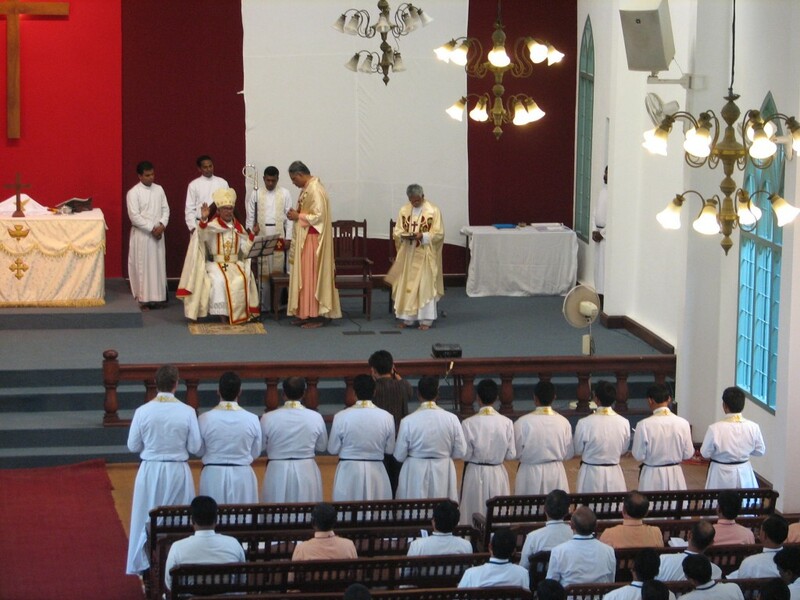 Yohannan in robes with a bishop’s staff. I asked GFA COO David Carroll about this picture and he told me that “the picture you have was taken at an ordination service a few years ago, where it is a custom to dress in formal attire. This was a rare ceremonial occasion in India, and the special clothing was worn to honor local customs (much like is done here in the West for a graduation service).” Carroll told me that he has never seen anyone kissing Yohannan’s ring and was unaware of anyone doing it. Regarding church structure in India, Carroll said the organization is “thoroughly evangelical.” He added that “our organization and church structure is specific and unique to the areas where we work most heavily. Additionally, K.P. Yohannan’s title is understood in the countries where we work to refer to the senior leader of the organization.” GFA’s website also addresses the reasons for a more episcopal form of governance as being helpful in the countries where they register as a church. This accusation is unfounded and false. Furthermore, the specific testimonies of these accusations by some of the signers of this letter differ greatly and/or lack key documented facts about the actual circumstances surrounding their testimony. Although we tried to contact every single one of you to discuss particulars and come to reconciliation, you refused to contact us back and give us that opportunity. With a clear conscience before God, we believe that GFA leadership regularly encourages staff (at morning and evening prayer meetings, new staff mentoring teachings, required readings, Sunday Bible studies, etc, etc) to have a vibrant daily walk with Christ, with the foundation of that being a few hours of daily Bible study, private prayer, and corporate prayer. The emphasis is always, if the tree is good, the fruit will be good also. In addition, GFA leadership will take the time to listen and to help staff with life issues when they are approached, but are careful not to control personal decisions, including where staff choose to worship, who they marry, where they live, etc. That said, Gospel for Asia is not a vocation or a job; it is a God-given calling. If someone chooses to serve at GFA (all of GFA not just Dallas), they also choose to follow the requests of leadership including where they will serve and what they will do, as long as they believe they are called by God to serve there. This is also true of secular companies (such as McDonald’s, IBM, Wal-Mart) or the Army, and anywhere that people are to do what is asked of them as a requirement of their job or service. We cannot call this sin, nor will we apologize for this commitment which is taught by our Lord Jesus, Himself, and is normal for many Christian as well as some secular organizations. Finally, in your original letter, you included a photo of Brother K. P. in his formal dress as the Metropolitan of the church during an ordination service. Since Believers Church operates under government approved church status as a constitutional episcopacy, it is required that he wear this uniform during the ceremony of ordination of pastors. This is done only for a few minutes; much like it is done during college graduation ceremony here in the west. We are NOT Catholic, nor are we Episcopalians, nor Anglicans, etc., etc. Rather, we are a Spirit-filled, evangelical church, born out of obedience to Christ’s Great Commission command to make disciples in all the world. At the same time, our leadership team examined our HR policies and procedures, making improvements wherever possible, and affirmed the freedoms afforded to those called to the work of Gospel for Asia. While the board investigation concluded that there was no wrongdoing on the part of leadership, we recognize that, as humans, our leadership is not always going to be perfect. That said, Gospel for Asia is not a vocation or a job; it is a God-given calling. If someone chooses to serve at GFA (all of GFA not just Dallas), they also choose to follow the requests of leadership including where they will serve and what they will do, as long as they believe they are called by God to serve there. This is also true of secular companies (such as McDonald’s, IBM, Wal-Mart) or the Army, and anywhere that people are to do what is asked of them as a requirement of their job or service. We cannot call this sin, nor will we apologize for this commitment which is taught by our Lord Jesus, Himself, and is normal for many Christian as well as some secular organizations. Comparing GFA to a secular job is what “David” said one cannot do (“…Gospel for Asia is not a vocation or a job…”). If an IBM employee refuses to re-locate, then that job might be in some jeopardy but the employee’s standing with God would not be. If GFA makes disagreement over personal calling a matter of disobedience to God, then there is a problem with that practice. If GFA claims to speak God’s will for individual employees, then the potential for abuse is obvious. However, each of us saw troubling signs. Authority was being abused, ministry was prioritized at the expense of family, the ministry’s image was protected through dishonesty, and isolation from believers in the local church was encouraged except to raise funds. Seeing these behaviors come from our respected leaders left us puzzled, as you might imagine. One of the prevalent GFA teachings is that we should never share concerns with anyone but leadership. We were strongly discouraged from discussing issues with one another or with anyone outside GFA, which included our families and home churches, because we were warned that these people don’t understand our high calling and might pull us away. As a result, most of us did not share our concerns with anyone outside leadership until now. At GFA, the teaching on submission to authority is strong. They say the Bible alone is authoritative, but in practice, it is the Bible as interpreted by Brother KP or other leaders. Because of this, searching the Scriptures like the Bereans did is not commended but is discouraged. To question or disagree with something on which GFA leadership has clearly spoken is generally labeled as murmuring, grumbling or rebellion. When we did voice our concerns to a leader, sometimes he listened and explained. But commonly he responded with anger because our honest questions were viewed as rebellion—and some of us were fired on the spot! If not fired, we faced ongoing suspicion and distrust from leadership that led to isolation and ostracism from staff families. Whether we resigned or were terminated, most of us did not receive an exit interview. A hint of fear remains whenever we question GFA because we have been taught that to question leadership is like the rebellion of Korah. This may be a reason our first letter was not well received. According to GFAD, some GFA employees have reached out to make apology to individual members of the GFAD group. However, GFAD is looking for a more systemic response to their concerns. According to Carroll, the GFA board has taken their concerns seriously and made corrections where necessary. However, very little of what either side claims can be independently verified. I have read quite a few testimonies from former workers which are not yet available publicly. These narratives do present a pattern of intrusion and an expectation that small details of life be cleared with ministry leaders. However, while they sound compelling, I have not been able to verify them as yet. Perhaps as more people come forward publicly, the picture will get clearer. For now, interested readers can use these documents as a starting point for their research into GFA as a tool to help best steward their resources. Stay tuned for more. I intend to cover the other four allegations and explore a few other areas of interest. Author Warren ThrockmortonPosted on April 29, 2015 Categories Gospel for Asia, ReligionTags Believers' Church, David Carroll, Gospel for Asia, JD Smith, K.P. YohannanLeave a comment on Is There a Controlling Leadership Culture at Gospel for Asia? Today, in a blog post, Sutton Turner explains why he left Mars Hill Church. If I understand this story correctly some of the people who are still involved in legacy churches were involved in this matter. Furthermore, my sources tell me that at least one of those involved in this matter opposed the 21 pastors who brought charges. It may seem via Turner’s description that the challenge came from those who opposed Driscoll. My information is contrary to that. In any case, apparently Turner got a look at the view from beneath the bus. Recently, David Barton spoke at Knightdale, NC at the Faith Baptist Church. He spoke on Saturday and then again on Sunday morning. In previous posts, I described his false teaching on HIV and his faulty claim that 50% of students at Christian colleges abandon their faith. In the third session of his Saturday workshop, Barton makes many of the same claims he made in his book The Jefferson Lies. Because of those errors, Barton’s book was pulled from publication by Christian publisher Thomas Nelson. Michael Coulter and I debunked those claims in Getting Jefferson Right: Fact Checking Claims about Our Third President. In the following video, watch from 17:50 through 29:30 to hear the bogus claims about Jefferson. I have covered the stories about chaplains at the University of Virginia, the Thompson Hot Press Bible, the Virginia Bible Society and the Jefferson Bible on the blog. We cover them more extensively in our book. In this speech, Barton rehashed The Jefferson Lies for his audience, without correcting the book’s flaws. On his website, he has not corrected the false claim that The Jefferson Lies will be re-published by Simon & Schuster. The publisher has no plans to publish the book. I guess I shouldn’t be surprised but I still am amazed that Barton peddles these misleading and false claims in church.